Hello everyone! 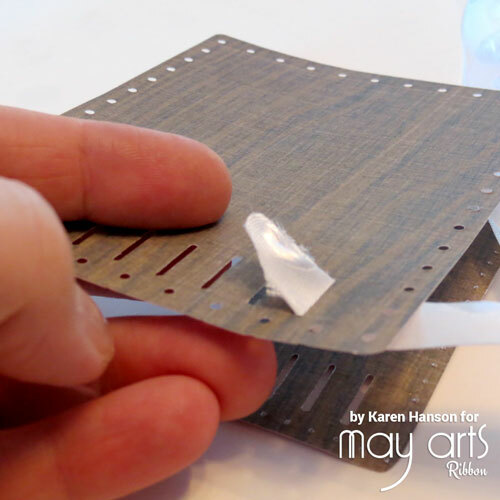 I am so excited to be participating on behalf of May Arts in Spellbinders Product Partner Holiday Blog hop today. 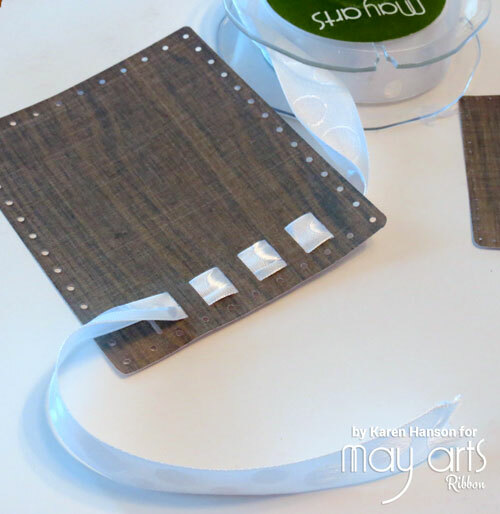 Spellbinders has teamed up with a variety of companies to showcase great product for all your holiday crafting and I get to share some ribbon fun! In my family, one of the things that kicks off the holiday season is actually a couple of late November birthdays, including my mom’s birthday (a special 65th this year). So I thought it would be fun to share a little card that was inspired by some warm holiday colours right from the Spellbinders inspiration tag, but all about birthdays! After all, just because Christmas is around the corner, that doesn’t mean we can forget about all those special people who celebrate birthdays around this time, right (can you tell that I might be one of them)? 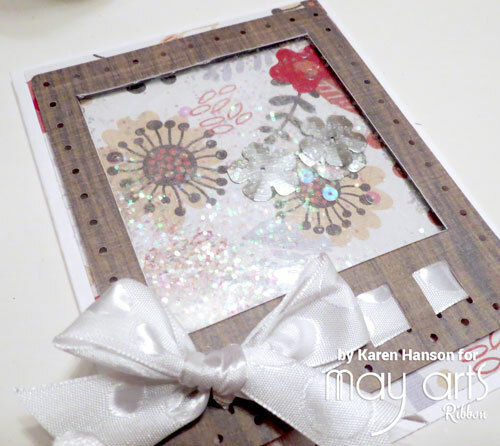 Using paper of your choice (I used DCWV’s The Weekend Neutrals stack)cut out the largest die in the A2 Fancy Ribbon Threader set. I trimmed off the bottom scalloped edge of my cut to give it a bit more of a rustic look. 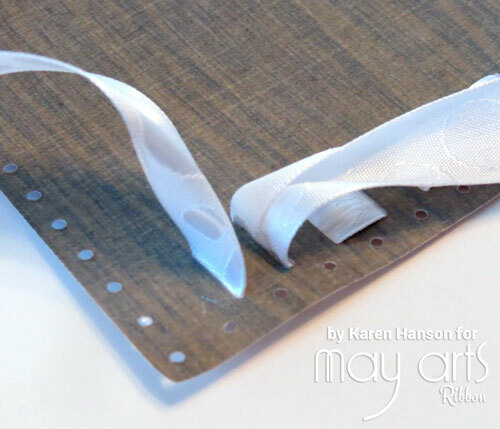 Trim the end of your ribbon into a point for easy threading. Don’t be too worried if your ribbon is wider than the cuts for threading – it will pull through and pucker nicely leaving some added texture! Step 3 Coming up from behind the first cut, thread your ribbon and pull. Continue weaving through seven of the cuts. 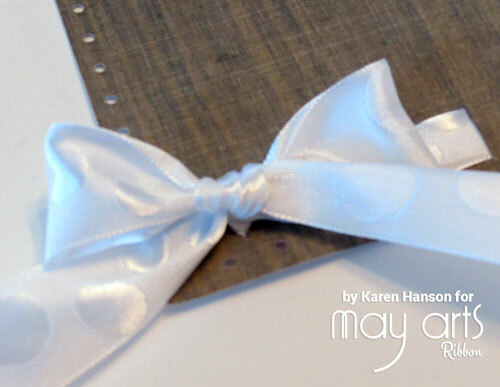 Trim your ribbon and use a dry adhesive to hold in place on the back side. 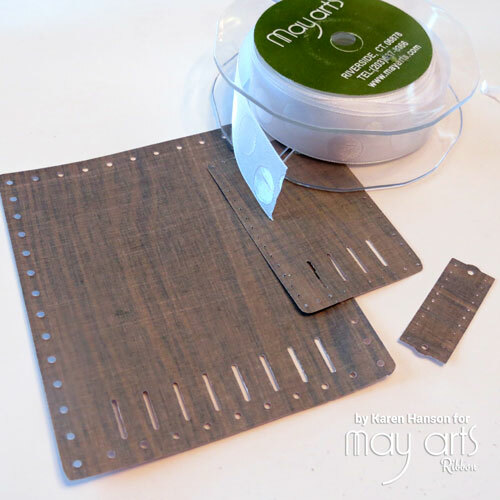 Starting from the other end of the die cut, weave the ribbon up through the remaining cut. Adhere in place with a dray adhesive on the back side. 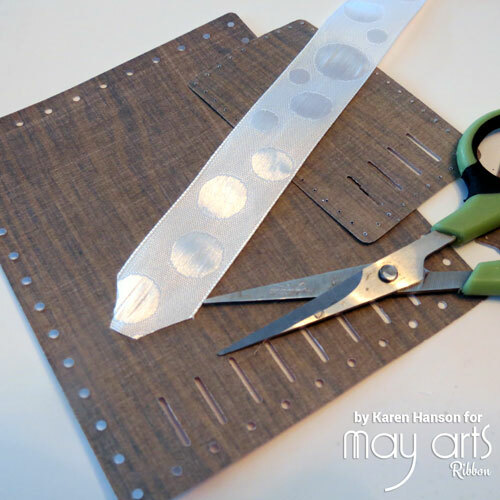 Using a metal ruler and craft knife, trim out the middle of the die cut above the ribbon line leaving a 1/2″ frame. 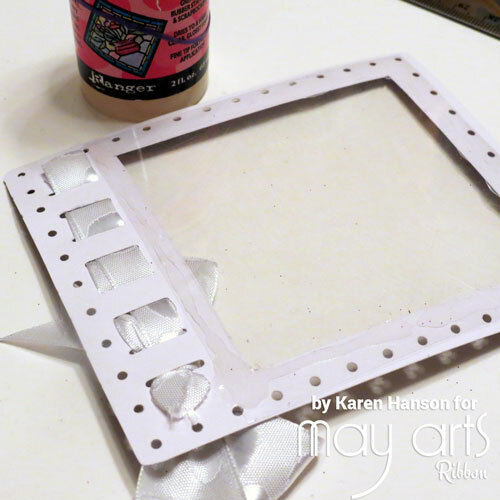 Flip over the die cut and use a liquid adhesive to attach a rectangular piece of acetate. 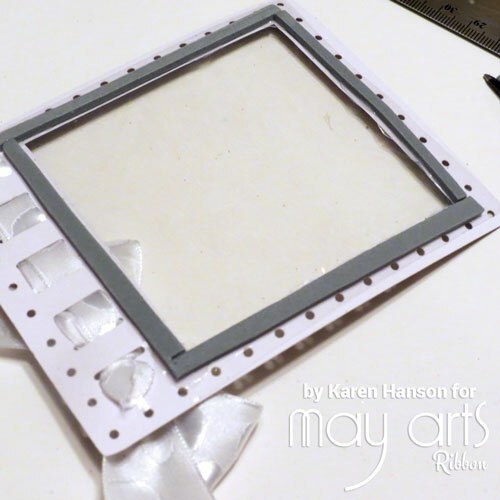 Using craft foam or a foam adhesive, create a border around the acetate. be sure that you foam is placed in about 1/8″ from the edge of your cut so it remains hidden when the card is viewed from the front. 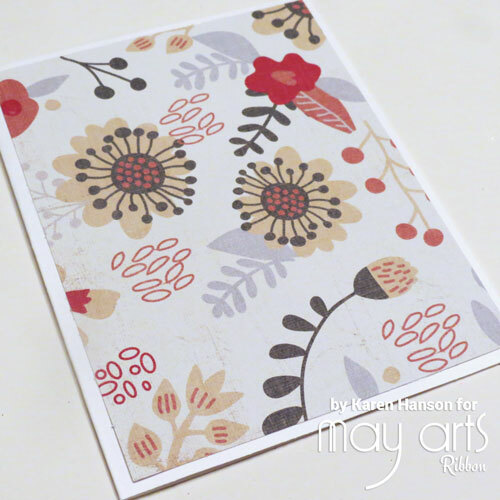 Prepare your card base by matting a 4 1/4″x5 1/2″ card base with a 4″ X 5 1/4″ piece of patterned paper. Place your card base on top and then flip over to ensure it is centered. Leave to dry. Embellish away! I have fun hand lettering a little sentiment and adding some of the the 3/8″ Velvet Adhesive Ric Rac for texture. The best part is that these cards make a little sound when you shake them – just like the sound of the crystallized snow as it falls! Now here’s the important part! Spellbinders is hosting a great giveaway to celebrate the hop, so you need to make sure you visit their page to find out all the details. You must visit all of the tutorials over the next three days to be able to win, and entries will be open for 48 hours. 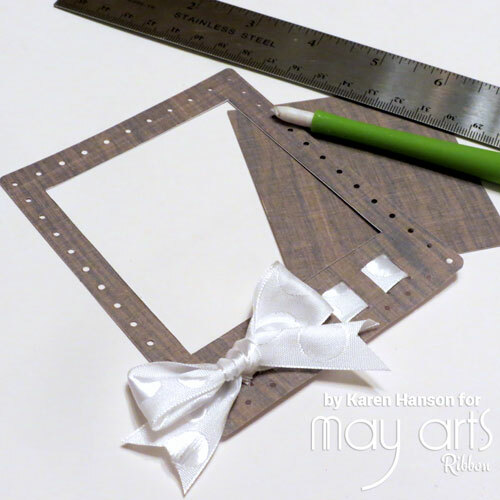 You also want to pop on by the May Arts blog because a certain Ribbon Lady may have told me that she has goodies in store for you too! 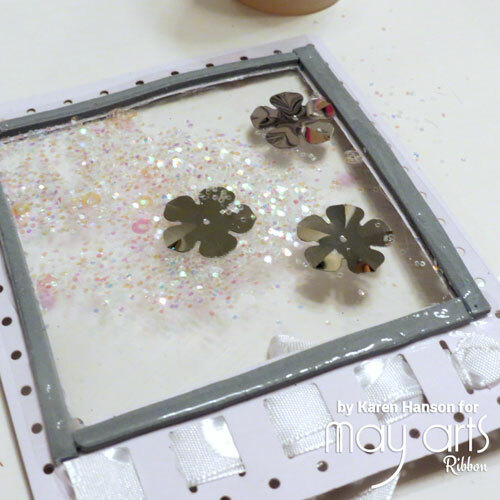 And what better way to celebrate the holidays than with some free crafty goodies for you! Have a great time hopping! Thanks for stopping by! 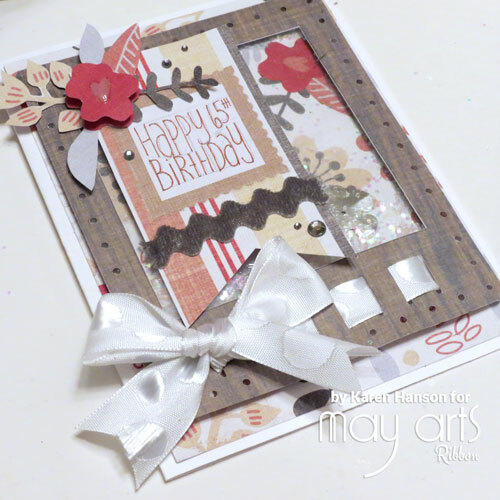 This entry was posted in Cards, DCWV, May Arts Ribbon, Tutorials and tagged birthday, DCWV, May Arts, shaker, Spellbinders, Weekend Neutrals by Scrappy Canuck. Bookmark the permalink. Beautiful card. thanks for walking us thru it, esp. the threading and bow.